When you live in Montreal and you have an affection for pretty dresses, there are plenty options available to you. But when you are looking for a tailored dress that exudes femininity with a touch of sassyness, only one name comes to mind: BODYBAG by Jude. I came accross Bodybag as I was shopping for a cocktail dress. I wanted something stylish and unique to stand out in a crowd. I stepped into their boutique that also serves as an atelier located on 17 Bernard West and discovered a creative and fashion rich universe where the welcoming staff makes you feel right at home. Launched in 1998 by Judith Desjardins, BODYBAG is the epitome of a chic and urban style. Completely manufactured in Quebec, her collections have been featured many times at Montreal Fashion Week and more recently at Toronto’s L’Oreal Fashion Week. Judith Desjardins has a talent for designing striking dresses. With their body-hugging style, cinch waist and feminine details, her dresses are a thing of beauty. It's no surprise that Nicole Kidman, painter Corno and local stars such as Geneviève Borne and Arianne Moffat were seen wearing her swanky, yet comfortable creations over the past years. 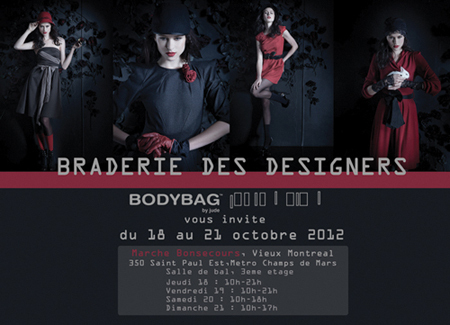 BODYBAG wil be at the Big Fashion Sale by Quebec Designers, which will take place at Marché Bonsecour in Old-Montreal from October 18th to the 21st. It's a great occasion to meet BODYBAG's team and possibly score a new outfit at a sweet price.